On the mind map page of the project, you can collect and organize ideas and information visually. In a mind map, you always have all ideas, concepts and drafts at a glance. In the project, on the Mind Maps page you find a new mind map. In the Edit tab, in the Mind Map group, click Edit Mind Map to assign a name. You can also add a new name by right-clicking the mouse, and then clicking Edit Mind Map in the context menu. 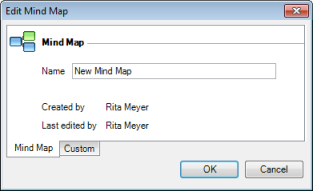 In the Edit Mind Map dialog box, in the Name field, type a name for your mind map. In this dialog box, click Custom to edit custom fields, which have been already saved in InLoox PM. For more information on how to add a new custom field in InLoox PM, see Create a custom fields. In the Mind Map group click New Mind Map . Right-click the mouse and choose New Mind Map from the context menu. Click in the lower menu bar. Keyboard shortcut Press STRG+M to create a new mind map. For further information on how to enter data in the opened New Mind Map dialog box, please see the upper part of the article. How to create a new Mind Map | InLoox PM 7 • Copyright 1999-2019 © InLoox, Inc. All rights reserved.